This is meant as a keepsake or a joke to give someone, but I have to admit, some of the pictures were amusing. Most of it was silly. 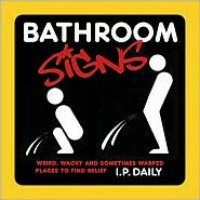 I was considering getting this as a joke gift for a friends who always seems to mess up which bathroom to go in to no matter where we go. But after looking at it one time, it is best left in the bathroom as a toilet cover book for guests.